Get a great price on the SMOK GX2/4 Kit from Vapor DNA. 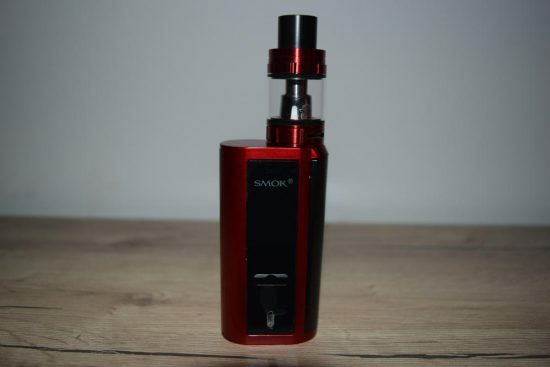 The SMOK GX2/4 is a modular vaping device that allows you to switch from a dual-battery setup to a quad-battery one with the simple press of a button. Forget having to buy two different devices to toggle between an elegant and stealthy design with limited battery life, to a massive four-battery mod that will last you several days without needing a recharge, now you can have the best of both worlds for the price of a single kit. This all sounds too good to be true, but after using the GX2/4 for about two weeks, I can assure you it’s legit. The SMOK GX2/4 comes in a large square cardboard box with pictures of the innovative vaporizer in both dual-battery and quad-battery modes, on the front, and a short manufacturer description of the kit, a list of contents and legally required warnings, on the back. 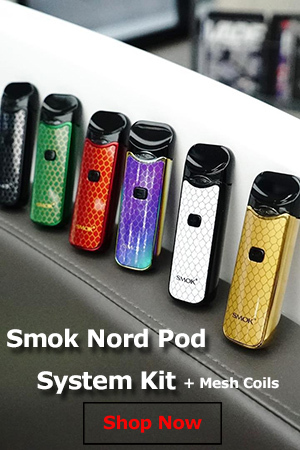 It’s SMOK’s usual type of packaging, only larger, to accommodate the special battery door that allows you to switch between the two available modes. Inside the box, we have the dual-battery GX2 mod sitting snug in a styrofoam holder, right next to the included SMOK Big Baby Beast tank, and a spare coil head. Underneath the first holder, we have a second styrofoam holder for the special GX4 add-on, which essentially holds an extra two batteries and hooks up to the GX2, as well as a micro-USB cable for firmware updates, and a bag of spare o-rings and gaskets for the tank. You’ll also find a user manual, a quality control card and a battery safety card. 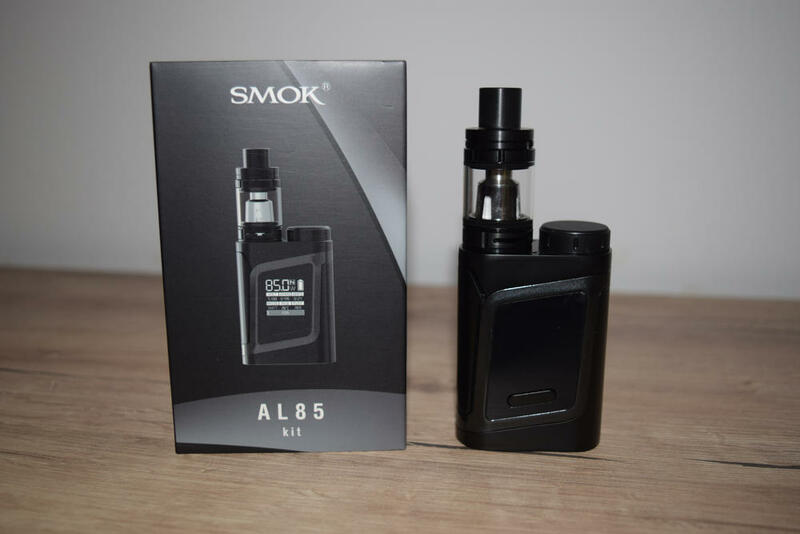 Apart from the special battery door/battery add-on, this is pretty much the same generous starter kit that SMOK has been selling for a while now. Let me just start by saying that the SMOK GX2/4 in dual-battery mode is hands-down the most gorgeous mod I have ever used. It’s hard for me to put into words just how great this device looks and feels in the hand, and the photos definitely don’t do it justice. I was a big fan of the SMOK Alien, and still am, actually, but this thing is much better looking, in my opinion. I like virtually everything about it, the simple-yet-elegant shape, the asymmetrically-positioned firing bar, the Alien display, the glossy finish. SMOK were nice enough to send me two color versions of the kit, the red and the silver. They are both beautiful, but the red one is simply stunning. If you prefer other colors, there are a total of 7 to choose from. In dual-battery mode, the GX2/4 measures 87.2 x 46 x 26 millimeters, and weighs 137.2 grams. After putting them side-by-side, I found that it is pretty much the same size as the Wismec Predator 228, only a bit slimmer. It has the perfect size and weight to feel great in the hand, if you ask me. 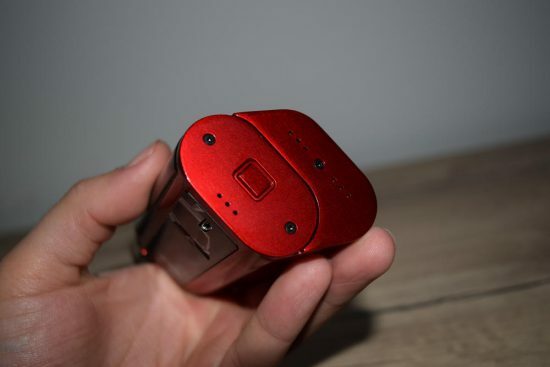 As you can imagine, this device is much larger in quad-battery mode, but it also has a completely different shape. 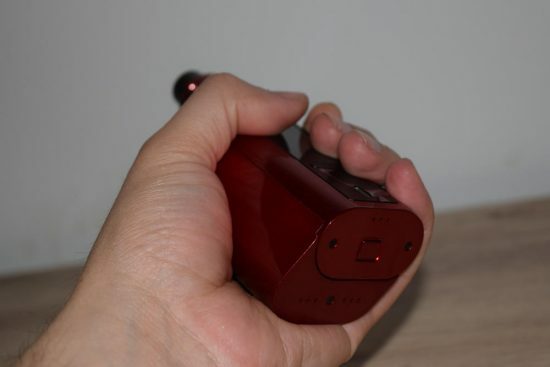 It measures 87.2 x 49 x 44 millimeters, and weighs 204.9 grams. Instead of the flattened cylinder shape, now you’re holding a large rhombus, which is not as comfortable in the hand. I found it particularly cumbersome to use, because I have small hands, and I was struggling to get good grip of it. It’s virtually impossible to wrap your hand around it completely, due to the large girth. 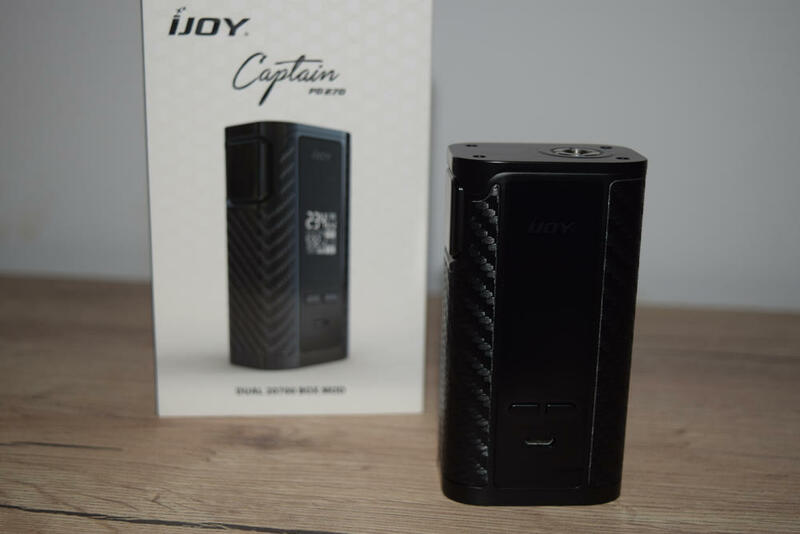 If I were to compare it to another device I’ve used, it would have to be the iJoy MAXO, which is also a four-battery mod. One of the most unusual features of the GX2/4 mod is the positioning of the firing bar. 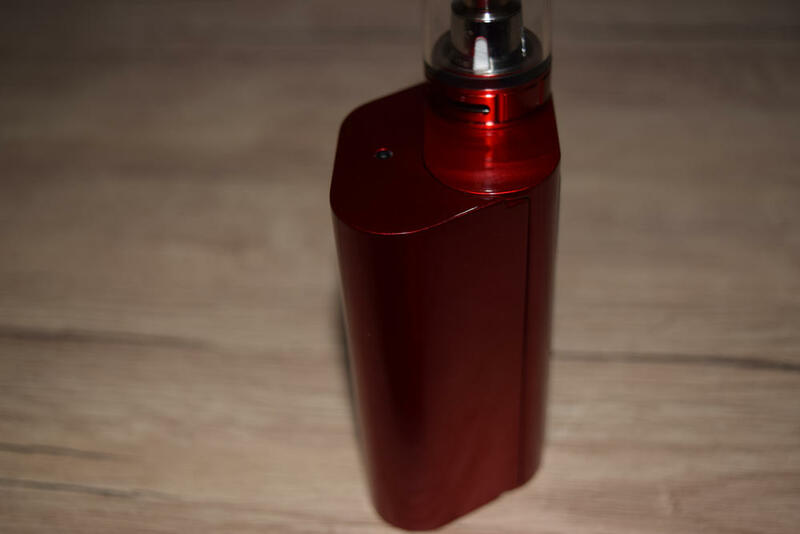 When using the device in dual-battery mode, you’ll notice that it is located on one of the rounded corner of the mod and doesn’t align properly with the atomizer. The asymmetrical design is interesting, but it’s more than that. When you connect the add-on for the quad-battery mode, the firing bar aligns with the atomizer perfectly, and you can easily press it with your fingers. This was basically the best solution to make the firing bar easily pressable in both dual and quad-battery mode. 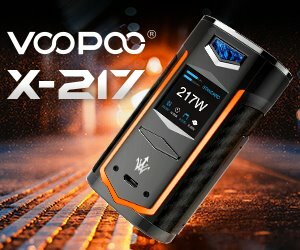 The display on the side of the GX2/4 will look very familiar, if you’ve ever seen a SMOK Alien 220W mod, or its little brother, the SMOK AL85. It’s basically the same large display with an abundance of useful information being shown on screen at all times. The button placement is also very similar to that of the Alien, as is the positioning of the micro-USB port, right under the buttons. The 510 connection appears to be the same type used on SMOK other mods, which is a good thing, because I’ve never had any issues with their connections. The gold-plated pin is spring-loaded and has a nice throw, but if there’s anything I would have liked to see, it would be moving the connection more towards the center. As it stands now, you can only use atomizers up to 24 mm in diameter, without getting any overhang. Anything over that will go over the edges of the device, in both dual and quad-battery mode. If there is one thing I don’t like about the dual-battery SMOK GX2/4, it’s the battery door locking mechanism located on the bottom of the device. The door takes up a whole side of the vaporizer, and locks in place at the bottom, Instead of the usual magnets, this device uses a latch mechanism, which closes when you press the door on the mod, and opens by pressing a button on the bottom. It’s a very simple system, but you have to be very careful that the door closes up all the way, or you’re going to have the GX2/4 turn off on you for no reason. 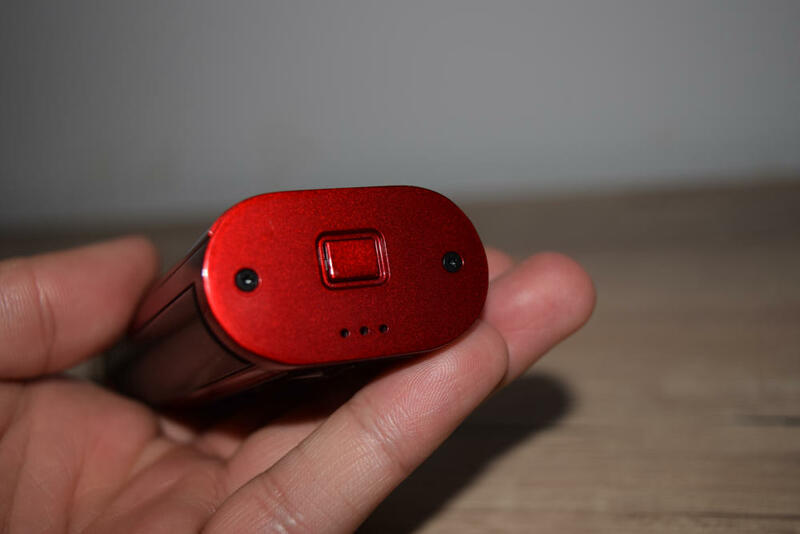 That’s because the battery door has these metal contacts at the bottom, which connect with two other contacts on the inside of the mod, when the door is shut. The GX2/4 does not turn on if the battery door is open, so if it is not closed all the way, it can cause it to turn off unexpectedly. The above case may sound like cherry-picking, but it has happened to me a few times, and now I make sure to press the door a little harder and check if it is locked in place. It’s not a huge deal, but I personally preferred the old magnetic battery doors. Another con relating to this locking system is that the device wobbles when placed upright. You just set it down on a table and you can see it wobbling a little bit. As far as I can tell, that’s due to the button on the bottom, which protrudes a little more than it should, making the base uneven. The mod won’t fall down, or anything, but this is definitely a design error, in my book. 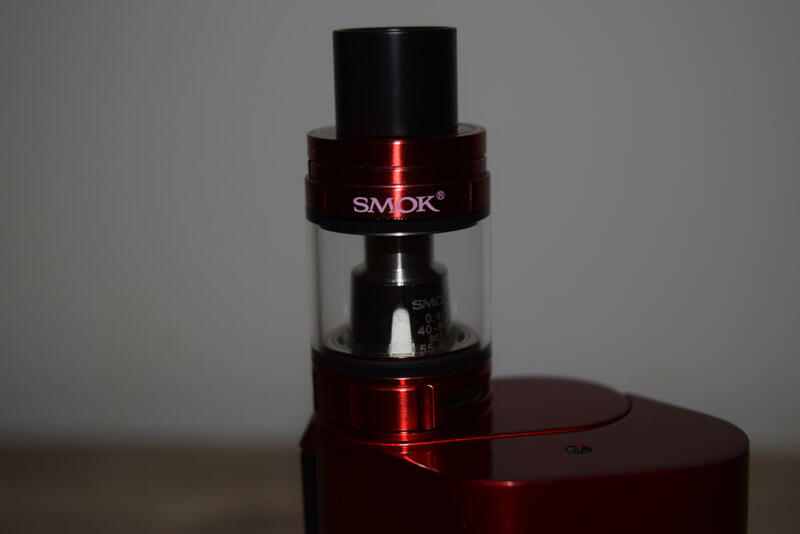 The glossy finish is different than what SMOK has been using on its mods in the past. It’s shinny, but it doesn’t turn the mod into a fingerprint magnet, which I like, but we’ll have to wait and see how well it holds up. I’ve been using mine for two week s now, and it’s still in pristine condition. Switching between the dual-battery SMOK GX2/4 and the four’battery mode is very easy. 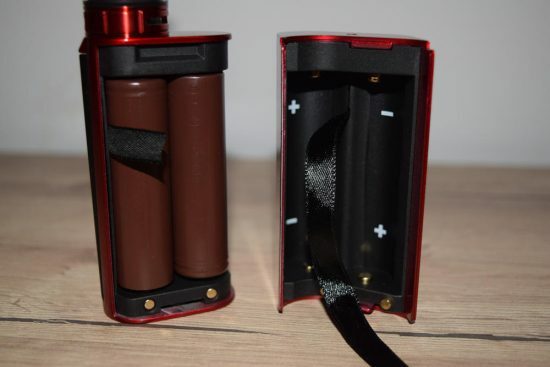 All you have to do is remove the normal battery cover, insert an extra two 18650 batteries into the larger add-on, and connect it to the two-battery mod the same way you would the battery door. It clicks into place, and all you have to do is press the firing bar five times to turn it on. The only difference you’ll notice is that the battery indicators on the display switch from “A” and “B” to “AB” and “CD”. 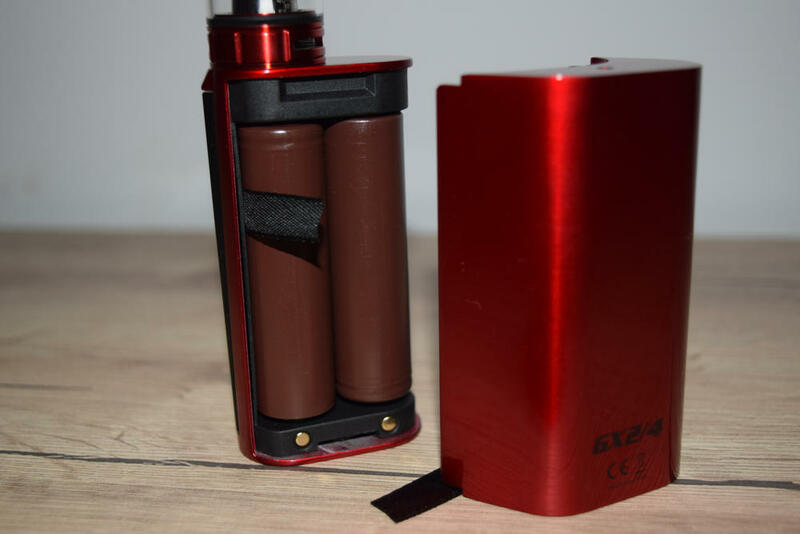 But you should also know that in dual-battery mode, the GX 2/4 has a maximum output of 220 W, while in quad-battery mode, it goes all the way up to 350W. Minor cons aside, I love the design and build quality of the SMOK GX2/4. I only used it in four-battery form for testing, but the dual-battery rig is my new favorite vaping setup. If you like sleek, stylish mods that look and feel great in the hand, you’re going to love the GX2/4 as well, I guarantee it. There isn’t a lot to say here, and by that I mean not a lot that I haven’t already mentioned in my reviews of other SMOK devices that have the same chip, like the Alien 220W and the AL 85. The menu, display and built in features are pretty much identical, and even the power output of the GX2/4 is the same 220W of the SMOK Alien. So if you’re looking for something new and groundbreaking, this isn’t it. On the other hand, the Alien chip is really solid, so it’s no wonder that SMOK is still using it for its latest products. The square 0.9-inch screen gives you all the information you could possibly want, from the mode you’re vaping in, to the wattage/temperature, battery life, as well as real-time voltage, atomizer resistance, generated amps, puff counter, puff timer and even the temperature of the board. As I said, it’s the exact same display that SMOK has used before, so if you want to know more about it, just check my older reviews. Since the SMOK GX2/4 uses the same chip as the Alien 220W, they also have the same options menu. Press the firing bar three times to access the menu. In “Mode”, you can switch between wattage mode, temperature control and memory mode, and select the pre-heat setting (Soft, Normal and Hard), or the wattage, depending on what mode you’re in. In “Puffs”, you can set a max. number of puffs and reset the puff counter, in “Settings”, you have a variety of screen settings, adjust the resistance of the atomizer, and download firmware updated. Finally, “Power” allows you to turn off the mod. You can only turn off the mod in the Power menu, as pressing the firing bar five times while it’s on will only lock the firing bar to prevent accidental activation. That’s about all I can say in this section. 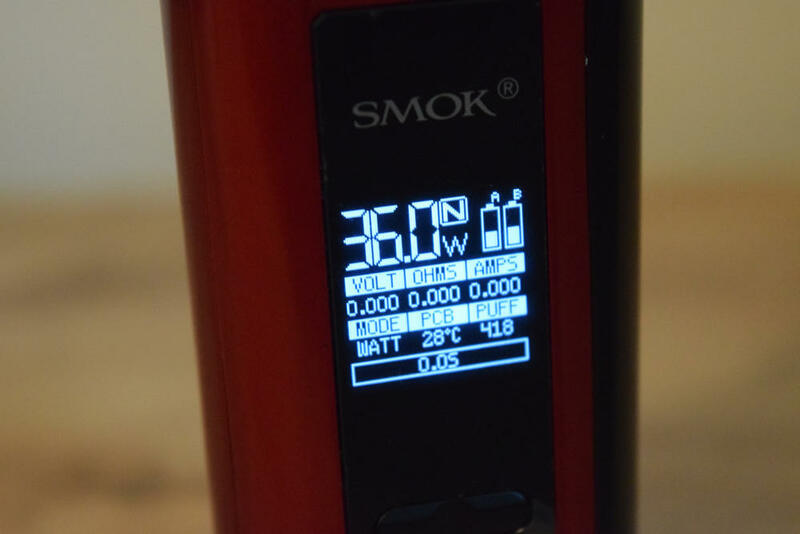 These are all things I’ve gone over several times in the past, so if you want to learn more about the menu and built-in features of the GX2/4, just go over some of my older reviews of SMOK vaporizers. The battery life of the GX2/4 obviously varies greatly depending on what mode you’re using it in. 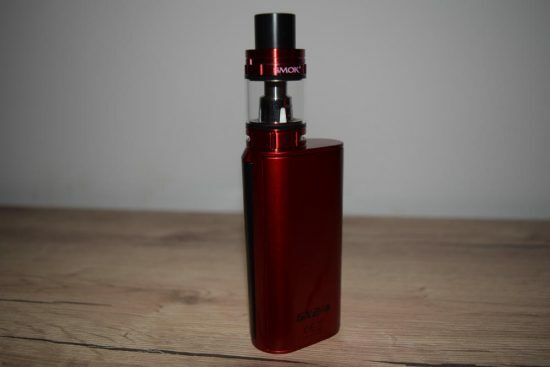 If you mostly use it in dual-battery mode, you’re going to get the same battery life you would from the SMOK Alien 220W, because it is essentially the same device with an improved design. I mostly used it around 60W, and I got about a day’s use out of it, which is what I usually get from most dual-battery devices. However, you should take that estimate with a grain of salt, as the overall battery life depends on a variety of other factors as well, such as what batteries you’re using and how much you effectively vape. I consider myself a heavy vaper, meaning I vape pretty much all the time. I haven’t been using the SMOK GX2/4 in quad-battery too much, mainly because it’s big, heavy and cumbersome to hold in my tiny hands, but I did do a battery life test, and got close to two days out of it, which was pretty much what I expected. It might not be exactly double the battery life of the dual-battery mod, but it’s close. But the thing is I would rather carry two spare batteries in a small case, rather than have to take the large four-battery GX2/4 with me. Luckily, with this kit, you don’t have to. You can just use the four battery at home, and quickly switch to the dual-battery mod on the go. Performance, or more specifically, the power output, also depends on what mode you’re in. the dual-battery GX/2/4 has maximum power output of 220W, same as the SMOK Alien, but with the add-on and two extra battery, the output jumps all the way to 350W, just like that of the SMOK GX350. 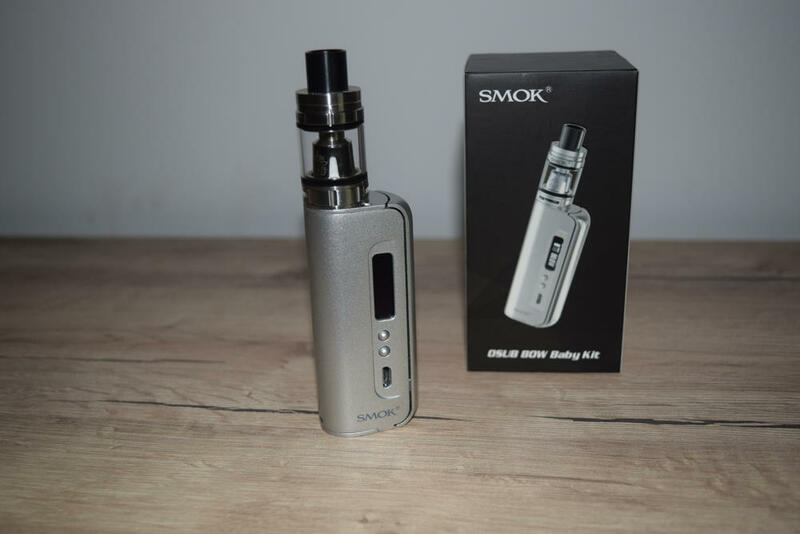 And this is what makes this kit special – instead of buying two great vaping devices separately, you get them in the same package, along with the freedom to switch between them whenever you like. Now, I hardly ever go over 100W when vaping, so 350W is uncharted territory, but I like knowing that if I ever wanted to vape at that insane level, I could. After two weeks of almost exclusive use, I’ve encountered no performance issues. Truth be told, I’ve mostly been using it in wattage mode, so if you’re more interested about the temp.control performance, this is probably not the best place to find them. I’ve tested temperature control both with the included stainless steel coil heads for the Big Baby Beast, and some RDA coils I made myself, and it seemed to be doing a good job. I’ve never had it jump out of temperature mode, or anything like that, and it did control the power output when it needed to, so that’s a “pass” in my book. But it’s not really that simple, so if you’re looking for an in-depth review of this feature, I suggest keeping an eye on DJLsb Vapes’ YouTube channel, he has all the necessary equipment and know-how to provide all the info you might need. In wattage mode, the GX2/4 is a bit better than the Alien, even though they share the same chip. I remember that the original Alien had a slight delay when pressing the firing bar. It was later fixed through a firmware update, but with the company’s new modular device, you don’t have to wait for a fix, because it fires instantly. And although I haven’t actually measured the output, it seems to be pretty accurate too, both in dual and quad-battery mode. The firing bar takes a bit of getting used to, due to its unusual positioning in dual-battery mode, and the fact that it’s a bit more resistant than that of the Alien. Also, only the upper half of the bar can actually be pressed, with the lower half serving a merely decorative purpose. But once you get the hang of it, it works flawlessly. Whether you’re looking for extreme performance or long battery life, the SMOK GX2/4 has you covered. 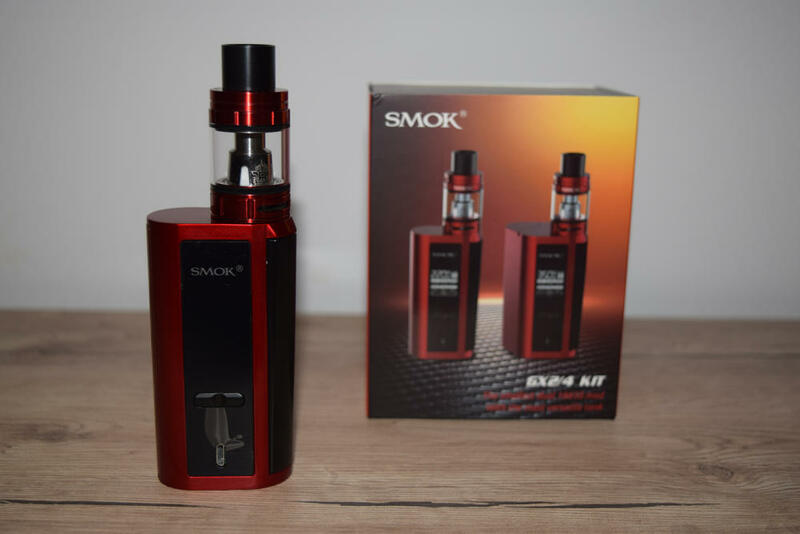 The SMOK GX2/4 kit comes with the Big Baby Beast tank, the company’s second most popular tank after the smaller Baby Beast. I’ve had a chance to review both of them in the past, and , personally, I like the Baby Beast more. However, I understand why SMOK decided to pair the GX2/4 with the bigger version – it just look better when you’re using the mod in quad-battery mode. My previous experience with the Big Baby Beast wasn’t a positive one. I liked the design , its large e-liquid capacity (5 ml), the swivel top-filling system and the plumes of vapor it produced, but it had a serious leaking issue. I tried using both included coils, but they both leaked like crazy, which, as you probably know, was really frustrating. Surprisingly, the Big Baby Beast I used during testing for the GX2/4 didn’t leak at all. I’m looking at it as I write this, and it is as dry as a bone. This leads me to believe that SMOK has a quality control issue, either with their tanks, or they coils, or both. The Big Baby Beast I reviewed a while ago was definitely not my only experience with a leaking tank, but usually it was either a design issue or my faulty coil wicking. In its case, it seems that the quality standards are just not the same for every product that comes off the line. 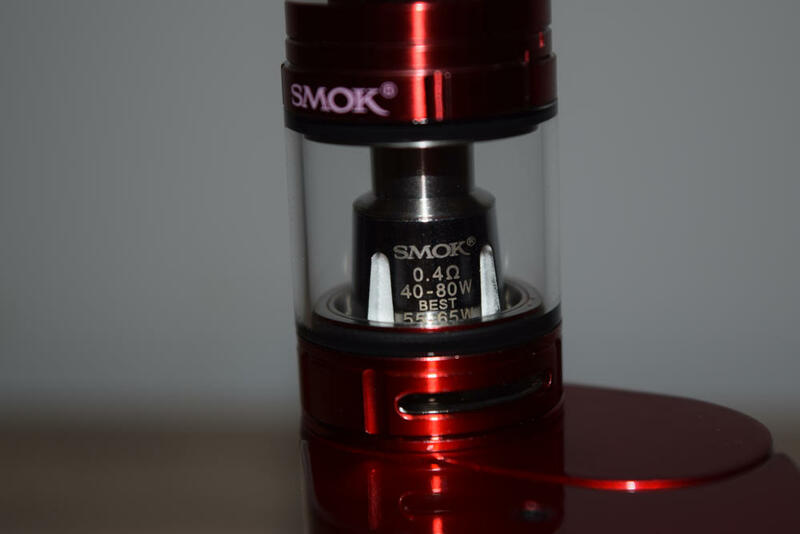 Anyway, the Big Baby Beast tank comes with two coil-heads – a pre-installed 0.4Ω V8 Baby Q2 core, and an optional 0.15Ω V8 Baby T8 Core, with the latter producing more vapor but also sucking up more e-juice. To be honest, they are both great coils when it comes to vapor production, and the flavor is not too shabby either. However, the SMOK TFV8 family of tanks, of which this atomizer is a part of, is notorious for its juice consumption, so you’d better stock up on e-liquid if you intend to use it on a daily basis. Overall, the Big Baby Beast is a great tank, if you’re lucky enough to get one that doesn’t leak. I’ve been a big fan of SMOK tanks ever since the TFV4 came out, almost two years ago, but I think it’s time for SMOK to come out with something new. They’ve definitely been pumping out new mods like crazy, but in the tank department, the options are limited to TFV4/8/12 and several variations of them, plus the occasional mouth-to-lung tank, like the SMOK Spirals. Hopefully, they have something in the pipeline already. 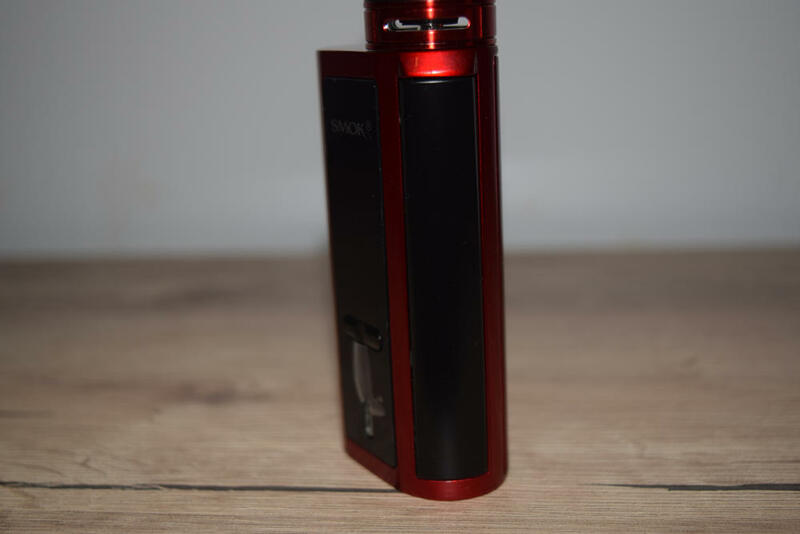 The SMOK GX2/4 was the first modular vaping mod I have ever used. I know Wismec has something similar, but other than that, it’s pretty much the only one I know of. I love it, despite the small cons I mentioned, simply because it gives you more options than a regular mod. 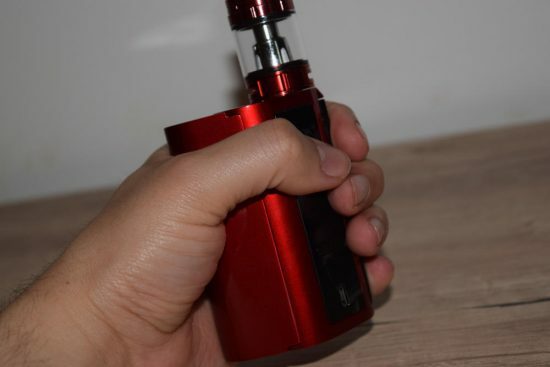 Instead of having to buy a couple of mods, one for portability and one for long battery life and extreme power, you can pay a little extra for a single kit and get the best of both worlds. It’s an efficient and cost-effective solution, any way you look at it, and I hope to see this idea implemented by other companies in the future. I haven’t used the quad-battery too much, but it’s worth a few extra dollars, just to know that it’s available at the push of a button. 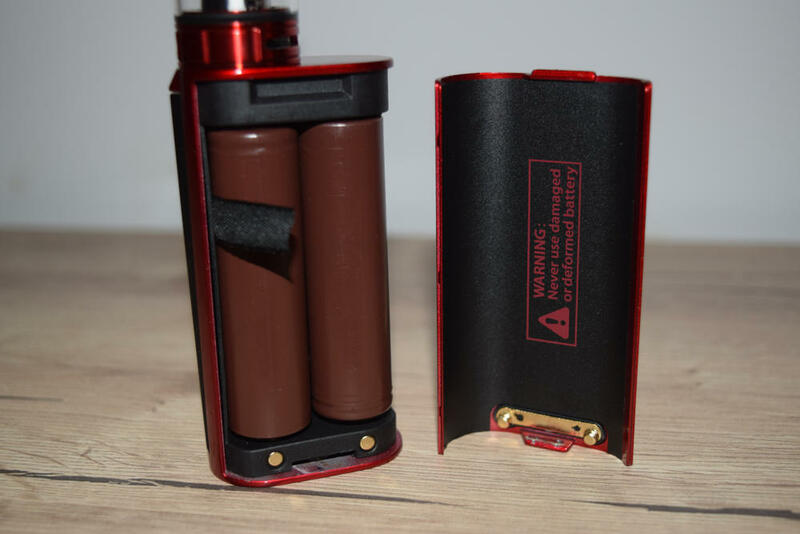 Do you know if Protected Circuit Board, longer +3 millimeters than regular batteries fits in the mod?